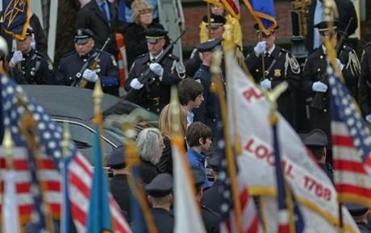 Thousands gathered to say goodbye to Plymouth Police Officer Gregory Maloney. PLYMOUTH — One by one, members of the Police Department here said goodbye in silence to Officer Gregory T. Maloney during a graveside ceremony held Tuesday on the same street where he died in a motorcycle crash a week ago. Chief Michael E. Botieri was first to say farewell, approaching Maloney’s silver casket and raising his gloved, right hand in a slow salute. He then removed his white dress gloves, placed them atop the coffin, and turned away from the burial spot at Vine Hills Cemetery. Each of Maloney’s fellow officers repeated the ritual as his widow, Susan, clutched his blue motorcycle helmet and the American flag that draped his casket. The couple’s middle-school aged sons, Gregory Jr. and Michael, sat on either side of their mother as the officers made their final salute and his casket was covered in white gloves. Maloney, 44, a motorcycle officer, crashed about 2:15 p.m. April 1 while riding on Samoset Street near the entrance of Plymouth Mobile Estates, Plymouth police have said. A medical helicopter took him to Massachusetts General Hospital in Boston, where he died, police said. At the time of the accident, Maloney was on patrol with another motorcycle officer, but his motorcycle was the only one that crashed, police said. Botieri has said there was no obvious explanation for the crash, which remains under investigation. Motorcycle officers from Massachusetts, Connecticut, and Rhode Island lined Samoset Street in salute as Maloney’s body was driven a short distance from the church to his final resting spot. Governor Deval Patrick; Senate President Therese Murray, a Plymouth Democrat; Attorney General Martha Coakley; and Plymouth District Attorney Timothy J. Cruz were among the public officials at Maloney’s funeral. The Rev. William G. Williams told mourners that “death is very much with us these days,” as people mourn Maloney, two Boston firefighters killed in the Back Bay, the passengers aboard missing Malaysia Airlines Flight 370, and those killed or injured nearly a year ago during the Boston Marathon bombings. 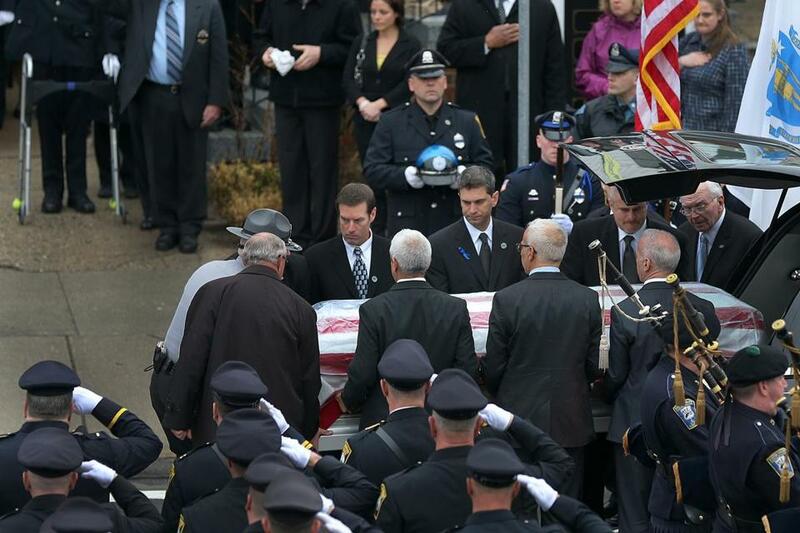 During his eulogy, Higgins asked Maloney’s sons to stand. He then addressed officers seated in the pews, asking them to stand if they planned to look after the boys. Every officer in the church stood up. “You will never be alone,” he said.